If you associate Vierne and Widor just with solo organ works it may come as a surprise to discover they wrote a number of religious pieces for organ and choir as well. Granted, the latter may seem relatively obscure by comparison but they’re worth getting to know. ATMA Classique are still quite new to me, but their recent Festival au grand-orgue – featuring the talented Dom Richard Gagné – proved to be a real treat. The choirs on this new album, so ably directed by Gilbert Patenaude, are both well established and well regarded. As for Vincent Boucher, appointed titular organist of St Joseph's Oratory in February 2015, this is his first recording in that role. The sanctuary's second organ is played here by Jonathan Oldengarm. Charles-Marie Widor and the influential organ builder Aristide Cavaillé-Coll were part of another French revolution, this time in the late nineteenth century, in which the king of instruments was restored to its rightful place as a serious musical force. That included new or rebuilt organs and an entirely different style of playing. In 1870 Widor replaced Louis Lefébure-Wély (1817-1869) as titulaire of Saint-Sulpice, Paris, which also boasted what many regard as Cavaillé-Coll's finest instrument. 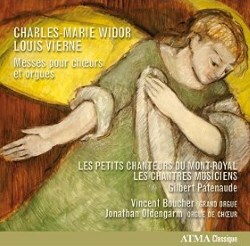 The young Louis Vierne was Widor's assistant there from 1892 to 1900. Vierne wrote his Messe solennelle for Saint-Sulpice, where it was premiered in December 1901. Scored for choir and two organs it follows the usual Mass format but – like Widor’s Op. 36 – it omits the Credo. I'm delighted to report that Gilbert Patenaude leads his musicians in a performance that’s both grand and intimate. They’re recorded in a warm, fairly reverberant acoustic with the voices atmospherically distant. As for St Joseph's newly restored 5,811-pipe Beckerath organ it’s wonderfully robust, with a firm, rolling bass. The Kyrie, so cleanly articulated, is lovely and there’s a radiance to the singing that’s very impressive indeed. The rest of the Mass is just as appealing. The Gloria may seem a tad unwieldy at times, but the organ part is glorious. The Sanctus has a lovely underlying barcarolle-like rhythm that’s well caught by the ATMA engineers. The more rarefied Benedictus, which reprises those beguiling rhythms, ends with satisfying weight and splendour. As for the Agnus Dei, it emerges with remarkable transparency, before ending with a heart-piercing sense of repose. Vierne’s two Op. 18 motets are just as beautifully presented; the Tantum ergo has inwardness aplenty, and the Ave Maria is sung with an artless fervour that’s most affecting. There’s another recording of an almost identical programme – plus Marcel Dupré's Quatre Motets, Op. 9 – with the Westminster Cathedral Choir conducted by James O’Donnell (Hyperion CDA66898). Predictably this is on a much grander scale, with a truly thunderous organ and that clear, very English choral sound. There’s a much greater sense of space here – it’s Westminster Cathedral, after all – with voices and organs placed in a wide, deep soundstage. O’Donnell and his forces, quite brightly recorded, find sharper contrasts in the Mass than Patenaude and his musicians do. That said, the latter’s performance is more personal – there's more light, shade and colour, too – and that's very refreshing. Ditto the two Op. 18 motets, which have a plangent loveliness in Montreal that’s missing in London. Broadly speaking, the same observations apply to the Widor works, although the Westminster performance of the Mass emerges with a thrilling heft that’s hard to beat. Both this and the less overt Montreal approach seem to ‘work’, but I suspect your choice of recording will depend on your preferred scale and vocal style. I’m mildly allergic to the very clean, almost white sound of English cathedral choirs, the boys especially; by contrast,the Quebec singers have a European warmth, a roundness of tone, that’s much more to my taste. Also, one could argue that O'Donnell, his musicians, and the Hyperion engineers emphasise the music's ceremonial aspects; by contrast Patenaude and the ATMA team really bring out its devotional character. Warmly communicative performances in very decent sound; well worth hearing.